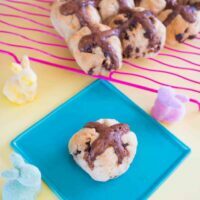 I making it my goal to make a hot cross bun recipe every year. 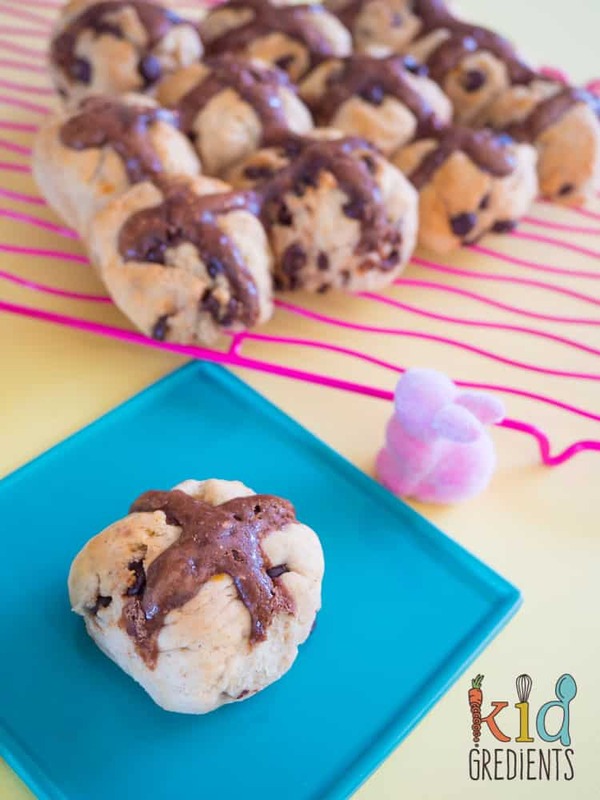 This year I’m doing chocolate chip hot cross buns. I have no idea what I’ll come up with for next year. The good thing about these ones, is they also have a gluten free version. Hot cross buns are so awesome. 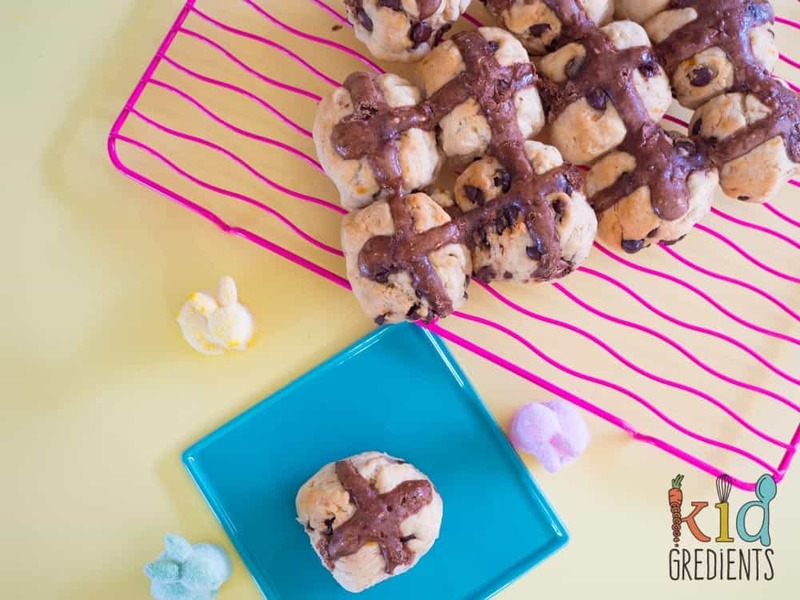 we try to either buy really good quality store bought ones or to make our own, there are two other flavours on the blog, normal hot cross buns and our favourite, apple cinnamon hot cross buns. Growing up I only ever had the fruit ones, and I think I used to eat them filled with a microwave poached egg! When I think about that now…it kind of grosses me out. I have to admit, I love it when hot cross bun season comes around! They are super tasty for breakfast, morning tea or afternoon tea. And these choc chip ones are no different! 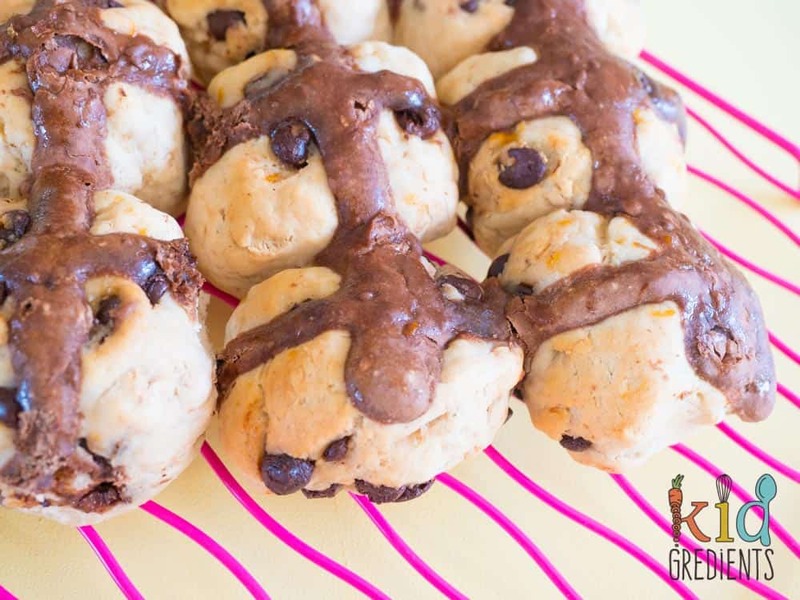 Packed with yum and a chocolate cross on top, they are sure to become a family favourite. Of course they freeze well- just defrost overnight in the fridge or quickly zap in the microwave in the morning if you forget to defrost them. Perfect with your morning “cuppa” when you get back from school dropoff! It would be wrong for the kids to get all the good stuff! 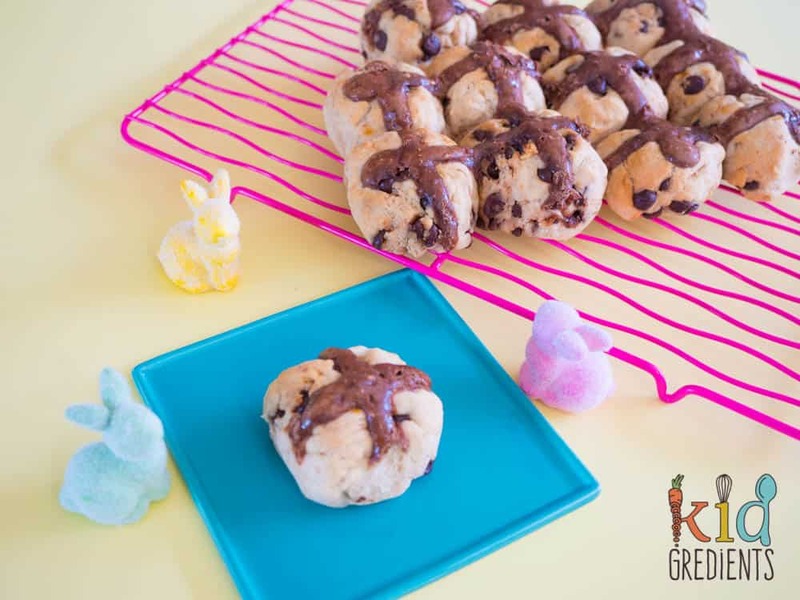 Get them in the kitchen and making these with you, they will love watching the dough rise- my daughter thinks it is a science experiment! How cool is that cooling rack in the photos? It was sent to me by bendo (it was gifted) and is so pretty! They have lots of other colours too! 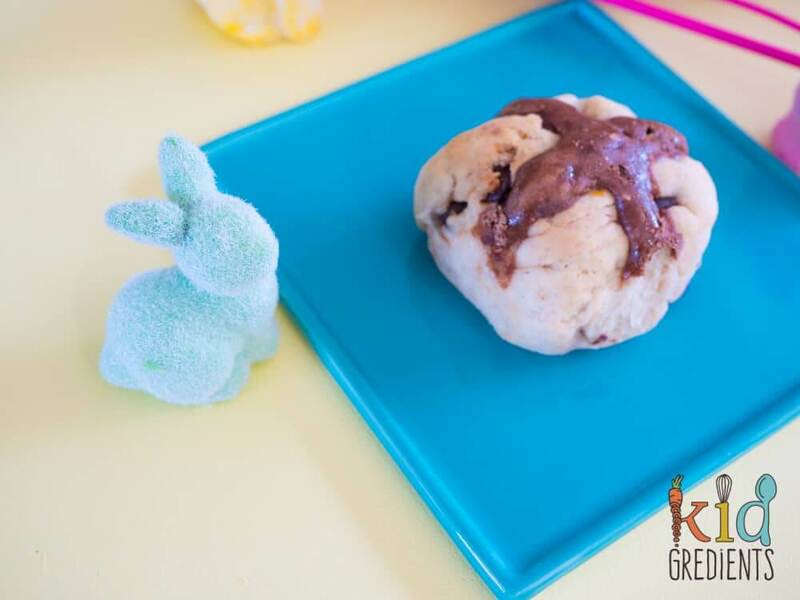 An updated, fruit free hot cross bun for the whole family. 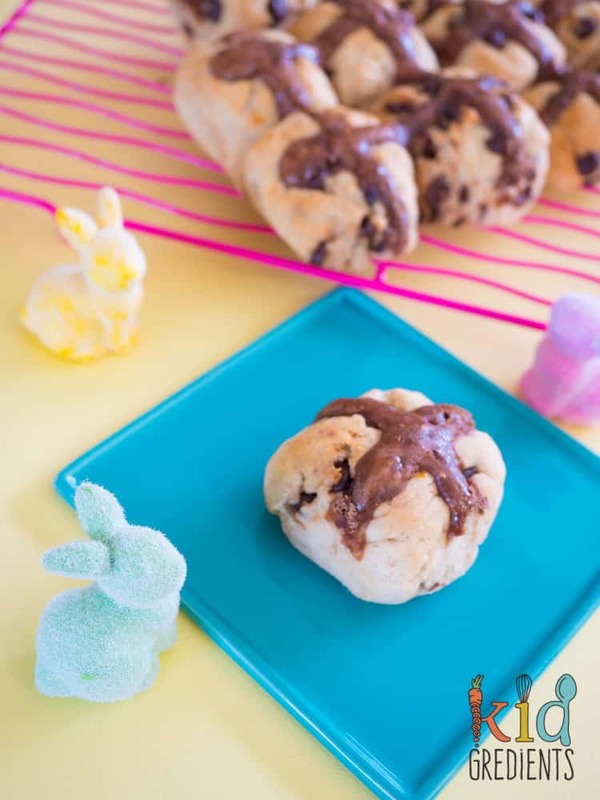 With chocolate chips these are super yummy! There's also a gluten free option in the notes. In a jug mix the cup of body temp water, 2 tbsps sugar and the yeast. Allow to rest until frothy. Combine the cinnamon, mixed spice and flour in a bowl. Add the butter and milk to the yeast mixture and pour onto the flour. 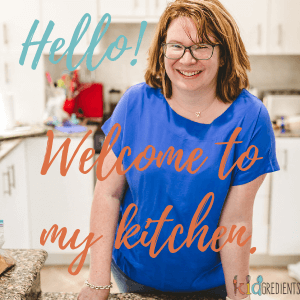 using a dough hook on your mixer (or do it by hand), knead for 1 minute on low. Add the choc chips and knead for 3 minutes on medium. Preheat oven to 180 degrees.Allow buns to rise 20 minutes more. Mix the cacao, sugar and water to form a paste. Using a piping bag or a ziploc with the corner trimmed off, pipe each row of lines in one go. Warm the apricot jam and use to glaze the tops of the buns. To make these gluten free, use gluten free flour and add 6 tsps of xantham gum to help with the density of them and the rise.